For those who believe that "bigger is better“ the APC45 is the perfect choice. It is not only one of the lightest and most compact .45 pistols on the market, but due to its internal hydraulic buffer it is the most pleasant to shoot. 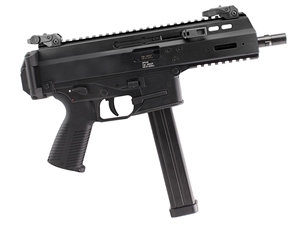 The APC45 PRO is a result of a requirement from US and German MIL contracts. The new PRO lower will accept AR/M4 type pistol grips, bolt hold open function and non-reciprocating charging handle. *Product may differ slightly from image shown.